We see black, white, gray and colored surfaces when the light they reflect reaches the eye and strikes the rods and cones. But in fact, any intensity of light can be reflected from any shade of gray between white and black. And any wavelength of light can be reflected from any color of surface. This is the basic problem of human color perception. It will be explained using various live demonstrations. Because the color of a surface cannot be determined by the light it reflects, the human visual system must rely on information from the surrounding context. The implications of this for both vision science and for art will be discussed. Alan Gilchrist is professor of psychology at Rutgers University, Newark Campus. 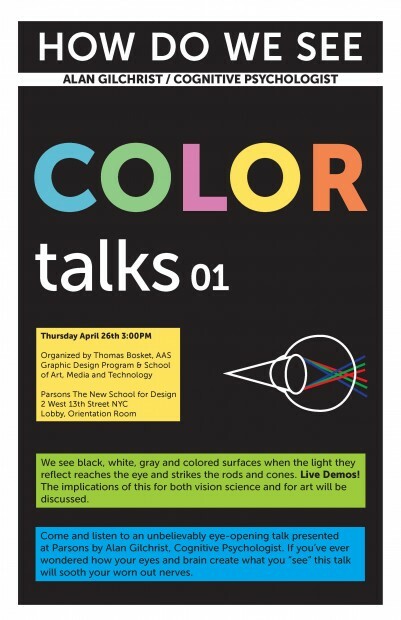 He conducts research on visual perception, especially the problem of how the human eye can see the black, white, or gray shade of a surface regardless of illumination level. He is the author of two books: Lightness, Brightness, and Transparency and Seeing Black and White (Oxford Univ. Press, 2006). He teaches visual perception and critical thinking. ‹Previous Post Why do we draw the figure?